Perform in an affordable space with technical capability. Make your wedding unique. Bring your organization together in an exciting new venue. Rent the Bartell Theatre! You can check out the Rental Calendar for dates of availability. 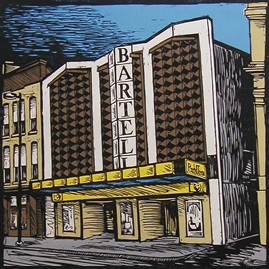 The Bartell Theatre, at 113 E. Mifflin Street in Madison, is located a half-block from the Capitol near parking ramps and great eateries. It contains two stage spaces, the Evjue Stage and the Drury Stage. Both are compliant with ADA regulations. The Drury Stage is a traditional proscenium space seating 199 + 4 wheelchair spaces. Its stage space measures 30′ deep by 40′ wide. Please see the Drury Stage Information Page for detailed information. The Evjue stage is a black-box style space with modular seating that can be set in various configurations. The whole space measures 30′ x 50′ and will seat up to 96. Please see the Evjue Stage information page for additional information.